Redexis, a Spanish integrated energy infrastructure company dedicated to the development and operation of natural gas transport and distribution networks, and the Balearic Islands Business Federation of Transport (FEBT) have signed a framework collaboration agreement for the development and promotion of sustainable mobility through the promotion of Compressed Natural Gas (CNG). Both organizations support the development of mobility through alternative fuels as one of the ways to enhance the fight against climate change, to improve air quality in cities and to contribute to achieving the objectives of sustainability and economic development. For its part, the FEBT will promote the use of CNG vehicles among its members in order to extend the purchase and use of natural gas vehicles (NGV). In addition, it undertakes to provide Redexis with information on the number and type of CNG vehicles of its members, in order that Redexis may have sufficient information to promote the gas infrastructures necessary for the supply of CNG in the areas where it is appropriate. Redexis on the other hand will build and provide public access to those CNG cargo facilities that are necessary to meet the immediate demand for CNG uses for land mobility. The signing of this agreement was attended by the Redexis Business Diversification Director, Miguel Mayrata and the President of the FEBT, Rafael Roig. Redexis currently manages a transport and distribution network of 1,200 kilometers and gives access to natural gas to 850,000 citizens in 17 municipalities of the islands. The company has invested more than 270 million euros in the extension of natural gas in the archipelago. At present, Redexis is already undertaking NGV projects thanks to the large gas infrastructure deployed throughout Spain, propelling very important initiatives with natural gas. 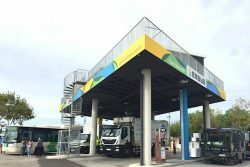 In the Balearic Islands natural gas fuel is already utilised by Emaya (the municipal fleet in charge of waste collection and cleaning in Palma de Mallorca), the fleet of Valoriza Servicios Medioambientales in Ibiza, and EMT (the bus fleet of the Municipal Transport Company of Palma), among others. NGV is a real alternative to petroleum-derived fuels such as diesel, and which reduces CO2 emissions by 30%, eliminates particulate emissions in the tube reduces nitrogen oxide emissions by 85%, and virtually eliminates nitrogen oxides in the exhaust system. emissions of sulphur oxides, which improves the environmental quality of the products. cities. NGV is a real alternative to petroleum-based fuels such as diesel, since it reduces CO2 emissions by 30%, eliminates particulate emissions in the exhaust pipe, reduces nitrogen oxide emissions by 85%, and virtually eliminates emissions of sulfur oxides, which improves the environmental quality of cities.